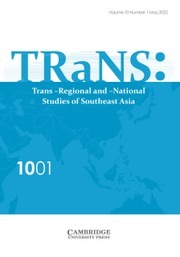 TRaNS approaches the study of Southeast Asia by looking at the region as a place that is defined by its diverse and rapidly-changing social context, and as a place that challenges scholars to move beyond conventional ideas of borders and boundedness. TRaNS invites studies of broadly defined trans-national, trans-regional and comparative perspectives. Case studies spanning more than two countries of Southeast Asia and its neighbouring countries/regions are particularly welcomed.